How much school spirit did you have during your high school years? I'm thinking about this because I just received a notice of our Reunion this May. 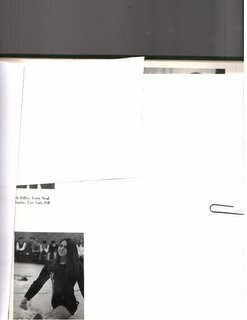 Of course, that necessitated a look at all my old yearbooks after finding them in the attic. I know in the States, big Marching Bands are huge as we've read about Steve's daughter in,Bullet Holes In The Mailbox, and in his daughter's blog, Water Baby. 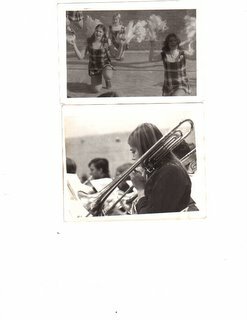 In Canada, back in the early 70's, Cheerleading and Band were still popular. Well, it amazes me that I could ever do splits because I sure can't even come close now! It was a great activity to be in and was the perfect outlet for my enthusiasm. After practising almost every day, it also served as great exercise to lower my blood sugar. (Sorry for all the white space but I can't figure out how to get rid of it!) I became diabetic in Gr. 9 and my doctor suggested I join a sport. My older sister was a cheerleader and loved it so I thought I'd give it a try. I had to practise a lot to get good enough to even risk showing judges what I could do. It was a real surprise that I was given a chance to participate in this exciting team sport. I loved singing in the choir and tried to play the trombone in our Band. The choir probably was the only activity similar to any I do as an adult. My enthusiasm for any group to which I belong, still abounds today. So were you in any activities you really liked? Did they help you in any activity you do as an adult? What do kids do today in school? Mother of Invention, hoping no one asks me to do the splits at the reunion! HA! Wow! You did a ton of activities and so do your kids. I think that's great! It sure makes school an enjoyable place... if you have to be there anyway..you might as well make it fun! Do you really see Sally in me now? I'm takin' that as a compliment but I can't see it as much as I used to in Gr. 9! Mother of: I was in a bad mood from age 15-25, but I did play football and tennis in high school. I shall not comment about my grumpy mood at that point any more, except to say that later in life I was a high scool teacher and cross country and track coach. Young distance runners, in my experience, are a smart and interesting bunch, a pleasure working with them. Posted early in my blog. I tried out for cheerleading but never made it. I was in the CYO (Catholic Youth Orginization) drill team and marched with a saber, rifle, and flag at different times. I loved it. Then it was dancing everyweek at the Surf ballroom. Those were the days! I consider high school a waste of 5 years of my life (in Quebec, high school was from grades 7-11). I found it boring, tedious and sumpremely unstimulating. It seemed designed for the sole purpose of keeping us off the streets until we were old enough to go to college. Happily, I have never been contacted for any reunions and would ignore it if ever I was. I'm most impressed that you could do the splits! I was active in a lot of clubs in high school, but I also spent a lot of time studying. I played the organ sometimes at my church (Presbyterian back then) so I spent a lot of time practicing. I was really pretty nerdy, spending more time with a group of girls than with boys. My 40th high school reunion is this June. I'm still thinking about whether to go or not. Gr: Football was big in my high school. What did you teach and why did you change careers? My husband was a distance track kid (10 k)thanks do a bright coach like you who turned him onto running and recognized his ability. He still runs 3 times a week. You probably had a profound impact on kids and didn't know it. Colleen:I loved Gidget! Sally was my idol then! Tried the link but I couldn't view it. Sounds like you had lots of school spirit! Richard:Hokey man...wish you had gone to my school in Ontario! I think you would have had a better experience. We had fabulous teachers and had something for everyone..lots of neat science clubs,debating ...you would have something to thrive on and tons of friends with similar taste. We had a huge school with 1150 kids. Gr. 13 was fairly difficult and you couldn't get away with not doing homework. In some ways, it was harder than 1st year university. Barbara: I'd go to your reunion! It would just be interesting to talk to some people and see what they're doing, even if you hardly knew them...Nothing to lose! I hung out with what we called, "Stag Bags", babes without steady boyfriends, and had great fun. I could have studied more..especially in math and sciences...definitely not my forte! I liked English, French, Geog., History and Music. 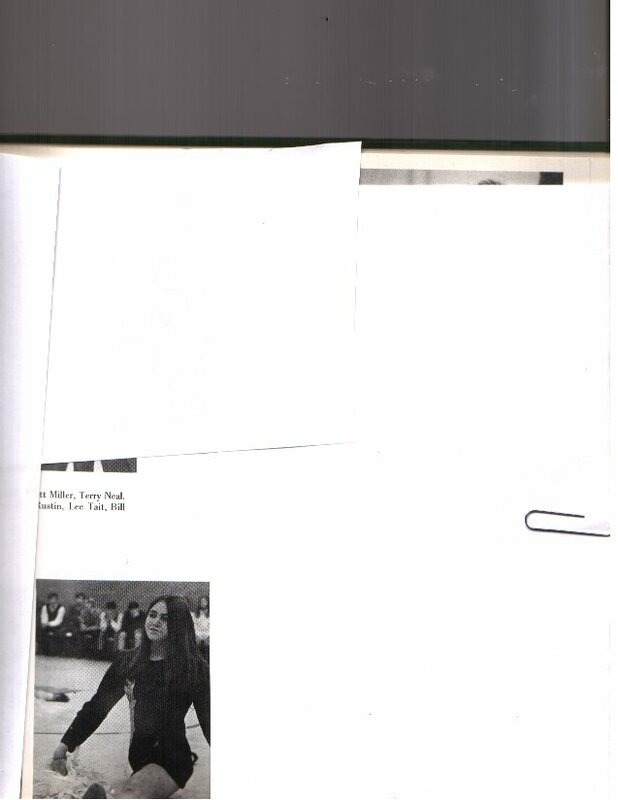 In high school, I was on yearbook staff. In a way, it did help me now as I'm a teacher. I learned how to arrange pictures and text, which comes in handy as I write weekly newsletters, create and maintain a class webpage, and put up bulletin boards. The best was my Sr. year, when I had the opportunity to work w/ a 4th grade class everyday for an hour and a half for credits. I also was able to teach Spanish to Kindergarteners twice a week. I was in band from 6th through 12th grades, and for 2 years in college (I think I was the only non-music major to do so). I played trumpet, tuba, french horn and fluglehorn. I was in marching band, symphonic band, jazz band, and in college the symphony and a brass choir. If I hadn't turned to computers I think I would've had a career in music. Abigail: You did some great things and it did help you certainly in your position as a teacher. I bet you participate in school spirit days where you are now. I sure did and the kids always thought it was neat to see their teacher dress up funny and go up in front of the assembly. Bob: WoW! I had no idea you were so musical! Fabulous! Do you ever play in local bands or do anything with that music training now? Are your kids musical at all? Wish I had mastered the trombone better. My sisters played the trumpet and French Horn. I loved the old swing dance band! Gr: What a great background you have and you had such impact on all those kids. Were you getting disillusioned with teaching or was the artistic side of you just beckoning louder? Many here became cynical with the change in curriculum..it was so out of range and spawned generic impersonal report cards...we were shoving it down their throats with no time to actually consolidate it. You are so lucky to have other talents so you didn't feel stuck in something you didn't like. I actually really liked most of it..except the political crap and getting evaluated etc. Me? Cross-country and track (the distance events) for sports and choir as well. My son does the obligatory soccer and is taking swimming lessons at the 'Y'. Diana: I can see you as a joiner and into healthy living even then. Do you still run or walk for fitness? Good to have kids in activities before school starts too and then they're used to participating and will join school activities. That's my observation anyway. Gr: Yikes! Really? A fearless leader gets caught?! Such juice! Well, that stuff's always gone on I guess. Big huge affair going on in my little public school now. Messy stuff. Guess you could say they staunchly believe in extra-curricular activities! I don't play anymore and I really miss it. In middle school my son played tuba and my daughter trumpet, but neither carried it forward in high school or beyond. I've been toying with the idea of learning to play the piano. I am sure it was not high school per se that was the problem, rather it was the particular high school I went to. The problem with growing up is that you don't have the experience until it is too late. I suppose we can try to learn from other people, but I find other people are not always objective and oftentimes have agendas they are pushing or ideologies they want to forward. What a cutie you are in these pics! You do favor her but I was even more reminded of Laurie (Susan Dey) on the Partridge Family show. I could never ever do the splits but I could run very fast LOL! I was the fastest runner out of 100 girls in grades 8-9 and was in track in grades 7-8. Bob: You should really get back to something like that. It is clearly beckoning you! I'd love to play or sing in a jazz band! Richard: Sure doesn't sound like it was a great school. Did Quebec have a gr. 12 and 13 or college prep or did you just go to college from Gr. 11? 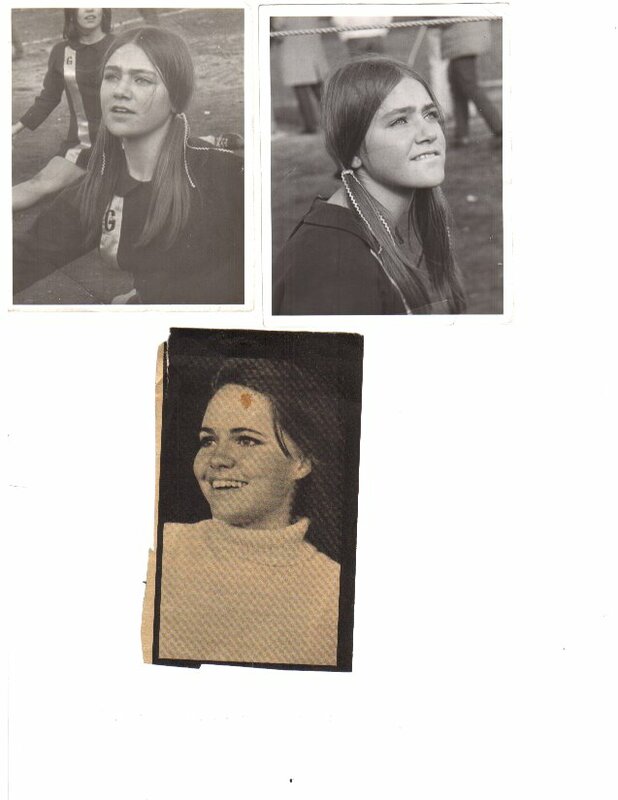 Lynclay: That's so funny since Susan Dey is the other one people used to say I looked like! More recently, Ellen Pompeo who plays Dr. Grey on Grey's Anatomy. Wow..you were a track star! Do you run/jog now at all? I was a cheerleader for one season in middle school, and only by default: not enough cheerleader-wanna-bes in my little private school. I was terrible at it, totally uncoordinated. In high school I was on the newspaper staff, intended to be a journalist. Life took me in other directions but I'm still passionate about the written word and occasionally write something almost worth reading, if only for my own amusement. I was voted "most school spirited." 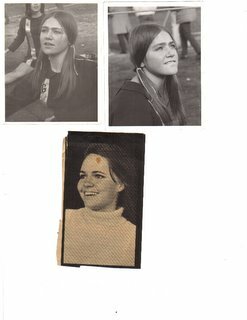 Probably because spirit week seemed like Halloween to be and I really got into character - and got my pic in the h.s. yearbook dressed as the school mascot. I too was a cheerleader and actually was head cheerleader for my last year. I used to love going to all the games, especially the ones where we all had to pile on the bus to go to another school. Fun times that's for sure. Rapunzel: Many writers/bloggers I know were involved in yearbooks and news clubs which was a good connection to what they actually use. Doing splits doesn't help me now! Teri: Sounds like you were a real fireball of enthusiasm and spirit! My school would have loved you! Do you do anything musical or athletic now? Piano? Jog? Run? Are your kids musical or athletic? Coll: Hey, I was captain in Gr. 13 (our last year)too! I loved selling tickets for the bus at lunch hours...we'd get out of class and get to talk to tons of people! I was always excited to cheer at football and basketball games. Some of those late season games were pretty cold and we huddled under blankets to keep warm! splits..ha! yesterday i was trying to do the high kicks (inspired by the rockettes) and it left me quite breathless. i wont be able to get anywhere near the rockette girls, but i had fun, being goofy. you know,,i got these tulips at costco, they ahd the bulbls immersed in a lantern vase im water, the bulbs were sitting ont op of a filter with big holes in it, so the roots grew down into the water, and the bulbs were above them, i was skeptical, but actually tey grew very well and look amazingly beautiful and warm. hope you find some beautiful tulips. those and cherry blososms are my favorite spring flowers, and forsythia too. Yup. Charles and I both run for exercise. Me, usually on the treadmill with a movie or something playing to take my mind off the exercising, Charles outside with the dog. I prefer to have my outside time untainted with pain and woe, usually with a spade and gardening gloves. have fun at your reunion- i have yet to go to any of mine! No, it was not a good high school. Not that I blame my parents, they did what they thought was best. In Quebec, high school is from grade 7 to 11. There is no middle school and there is no grade 12 or 13 or OAC. After grade 11, students may continue to study at CEGEP (Collège d'enseignement général et professionnel, or College of General and Vocational Education). All students desiring higher education must pass through CEGEP. In CEGEP, there are two streams, a two year pre-university stream or a 3 year trade stream. I took a 3 year trade stream. I think it is superior to the system in Ontario (notwithstanding my high school). There is far greater variety than you will ever get in a high school. For example, Dawson College (which I attended), had between 8,000 and 10,000 students spread over a large number of buildings around town (they have since consolidated to one primary building). The variety of course subjects available to me was wonderful. I was only sorry I did not have more electives (which I used to take courses from theatre to oceanography to theories of man to linguistics and more). I was the only one of my friends to take a vocational program; they all took pre-university streams. I did eventually go to university, but as a mature student. I chose a vocational stream in large part because I was fed-up with school - I found it a mind-numbing waste of time. Picking up a vocation was the fastest way of acquiring useful skills without spending a lot of time in school. Not that work is any less mind numbing. Mystic:Thanks! Yes, I'd do anything for that energy and hope! I saw The Rockettes in Toronto at Christmas! What great shape they're in! I'm getting yellow tulips for Sat. when people are coming to dinner. I just got s forythia bush last year...I've always loved them. Diana: I guess there's no pressure to keep up with him if you run the treadmill! very conniving but wise! I've never run..too hard on my knees but I do a lot of walking and poling now, and biking in good weather. Steve: You played trombone! Wasn't it neat? You had to have a pretty good ear for that. I put a purple ribbon on mine just so I could tell mine..it became famous. I can really see you on the Debating team! You'd be entertaining. Do you still have that 8-min. speech? I was always interested in Native Culture. Richard: That does sound way more focused than our system. You probably had to be mature about your schooling, which I was not. I became so only in the last few years of university. I see you as a person who got a lot out of interesting university courses and to learn just for the sake of learning. You probably got more out of the tech school as far as job-related courses. However you look at it, you obviously read a ton and are a life-long learner. I need to do that more. What fun! I had a bit of school spirit - enough to be in the choir and join a team sport. Not cheerleading, but a team sport (bowling). I got a recent call for a reunion - yikes! I think you looked more like Melanie (Safka), the hippie chick singer (I got a Brand New Pair of Rollerskates, Lay down) from the 60's. Brooksba: Yah! Singing! Bowling is fun too, we didn't have that. Paul: Never been told that before and I don't really remember what she looked like. Knew the song and I never did rollerskate that well! Hi, hope you enjoy your reunion. It is interesting to see how others have (or have not) changed after so many years. I didn't do much activities while in high school as we had to spend a lot of time on school work. Looking back, I regret for not enjoying my childhood more. Thus with my elder son, we have enrolled him in different kinds of activities which he likes, so as to expose hime to different things: drum sets, piano, painting, skating, pottery, cycling, etc. - all at kindergarten stage. Activities may be reduced once he has started primary education. Fennymun: Thanks! It is too bad you couldn't have taken more time for activities. Didn't they have a lot of badminton and ping pong? I taught at a private school here for kids from Hong Kong and Malaysia and they did so much of that! It's great that you can offer your son some things you didn't have..just be careful not to over-schedule him! I see this a lot here from the kids I teach. Hello! My school didn't have any music activities - there was a rubbish orchestra of about 5 instruments which was a waste of time and when I started there was a choir. Unfortunately when I started the school a new music teacher also started, who killed the choir off, leaving no musical activities running successfully. Sports-wise I played hockey but was hopeless at everything else. So I think if there were a school reunion for me I'd be giving it a miss. Still see my friends from school now and then at holidays but I have no warm feeling remembering attending the place. Topchamp: That's too bad...but I'm wondering how the heck you became such a good musician professionally? Private lessons? I wanted to play field hockey but I wasn't that good. You would have loved our high school! Splits? I used to be able to do leg in front and leg in back and out to the side. Ballet! I did try out for cheerleading but did not make it. Old Lady: What? WOW! Were you made of rubber?!!! Frank Zappa and I probably wish you'd do the splits but perhaps for different reasons back then, never mind. Teaching Lizzie's class was great (when she was tanked on Listerine, because of the halitosis ( yeah right! )) 'cause it helped me deal with a bunch of people that needed guidance in theatre arts, since I'd already had 6 years of it at school and on stage. Norm: I watched Gidget faithfully whatever grade. Likely you and Frank may not remember being the 70's and all! Poor Lizzie and Mrs.Smiley...she always reminded me of a somewhat prettier Margaret Atwood. Bless their inebriated souls! Ah, I should have been in Theatre Arts but I was a late bloomer. I sat back and let the Norms and Colleen Louks' of the world shine.